So, you have been hearing about wedding sparklers from your friends, but are not really sure what they are and what they have to offer. Essentially, they are very similar to those sparklers for sale around the 4th of July and just in time for New Year's Eve celebrations. Many couples have begun to use them in their weddings instead of rice or confetti. They are ideal for handing out to your guests either at your wedding ceremony itself or at your reception. How are Wedding Sparklers Made? Most of these sparklers are made with a wire core covered in a material that is designed to create sparks when lit. Wedding sparklers feature an easy to light tip that ensures everyone can join in the celebration at the same time rather than having some of the sparklers burn out while others are still waiting to be lit. Most will burn with gold sparks, but in recent years, heart-shaped sparklers have been produced that burn with bright red romantic sparks. How long they will burn depends on the length of the sparkler. For example, a 10-inch sparkler will burn for approximately 45 seconds, whereas a 36-inch one will burn for up to 3.5 minutes. Are the Sparklers for Sale Today Safe? Safety is always a major concern at any event, but since most weddings have guests in all age ranges from young kids all the way up to senior citizens it is even more important on your special day. The last thing you want on your day is for one or more of your guests to be injured. This is also a good reason not to have your guests throw rice at you and each other. Wedding sparklers are considered to be relatively safe, even for kids as long as they are supervised, as the golden sparks they produce have been proven over the course of many years to be relatively harmless unless they get in someone's eyes. Of course, the sticks themselves do get very hot while they are producing sparks and need to be handled with care. They should also be placed in a bucket of water to cool down one they have burned out. 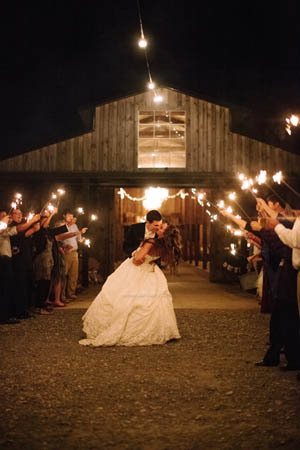 How Can Wedding Sparklers be Used? There are any number of ways wedding sparklers can be used to enhance your special day. You can place them on the tables at your reception for your guest to use, they make a great icebreaker. They can also be handed out at the wedding so that your guests can form a tunnel of golden sparks for you to walk through on your way to start your new life together. Many wedding photographers are now suggesting using the different types of sparklers for sale to add a touch of romance and color to your wedding photographs. These are just a few suggestions; there are so many other creative ways you can come up with to use sparklers to make your wedding day one that your guests will remember for a very long time.